Write the Java code, get the libraries from the Event Hub and Event Analytics applications in the Infor Grid, download the simple SLF4J logger, compile, and run. I used this code for my demo of picking lists in Google Glass; I would not use this in a production environment. DISCLAIMER: INFOR DOES NOT SUPPORT USAGE OF CUSTOM SUBSCRIBER OR PUBLISHER CLIENTS IN EXTERNAL APPLICATIONS. 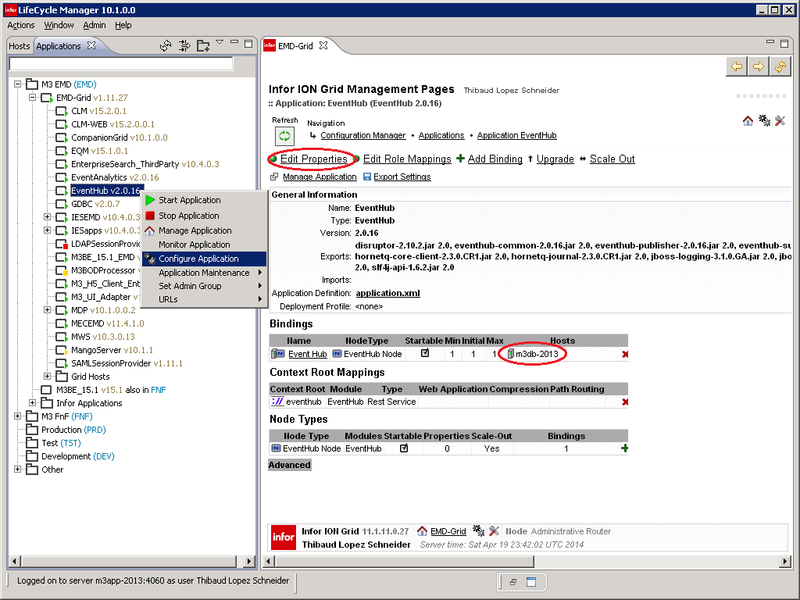 ONLY INFOR PROCESS AUTOMATION (IPA) AND M3 ENTERPRISE COLLABORATOR (MEC) ARE ALLOWED TO CONNECT TO THE EVENT HUB. USE AT YOUR OWN RISK. MAY VOID YOUR WARRANTY. It will persist a file data/subscriber/delivered/MyTest.rcv that contains a bunch of unique ids and that you can deserialize with a ConcurrentHashMap. Continuing my Google Glass project to display picking lists from Infor M3 onto Glass, here is how to use Event Hub and Event Analytics to get notified of new picking lists from M3 and how to process the events in Infor Process Automation (IPA) to get the details of each picking list: item numbers, item descriptions, quantities, and stock locations. This is a continuation of my previous posts How to create a picking list in M3 and Event Analytics for Infor Process Automation (IPA).The challenge is to determine which event to listen to, and from which database tables to collect the data from. I’m not completely familiar with the picking list tables so I got confused when I realized MHPICL is for the picking list headers despite the letter L in the name suggesting it’s for picking list lines, also when I realized there are three tables for picking lists instead of two like for deliveries, and when I realized there are two tables for picking list headers instead of just one, with inconsistent naming Picking and Pick. Over the years I’ve learned to accept the quirks of M3. So I used SQL to read each table and find my picking list. Observation 1: The picking list lines are in table MHPICD. So I’ll get my picking list details from there. Observation 2: Table MHPICD contains the columns for item numbers, item descriptions (usually found in table MITMAS), quantities, and stock locations, which is what I need for now, so I don’t need to do any joins with any other tables for now. My goal is to get one event per picking list so I can process the picking list in its entirety as a single entity; I’m not interested in getting one event per picking list line, four in my case, as that would loose visibility of the higher level abstraction that is the picking list. So what subscription do I need in Event Hub knowing there are six plausible tables and three possible operations Create, Update, and Delete? At first I tried the most obvious subscription M3:MHPICH:C for the creation of a row in the table of picking list headers. But that didn’t work because it was too early: by the time I had received the event and processed it in IPA the picking lines didn’t exist yet and I got zero results. It was the same problem with MHPICL. And I didn’t want to do complex processing like count the number of expected picking lines and wait for the last one to arrive, or bad design ideas like wait a second for the rows to be created. Observation 3: The subscription M3:MHPICL:U is the last one of the sequence so it will happen at the right time after the picking list lines have been created, and it’s unique per picking list so I won’t get duplicate events nor events per picking list line. Good. I’ll subscribe to that event. And the primary keys I’ll receive for MHPICL are Company (CONO), Delivery number (DLIX), and Picking list suffix (PLSX). 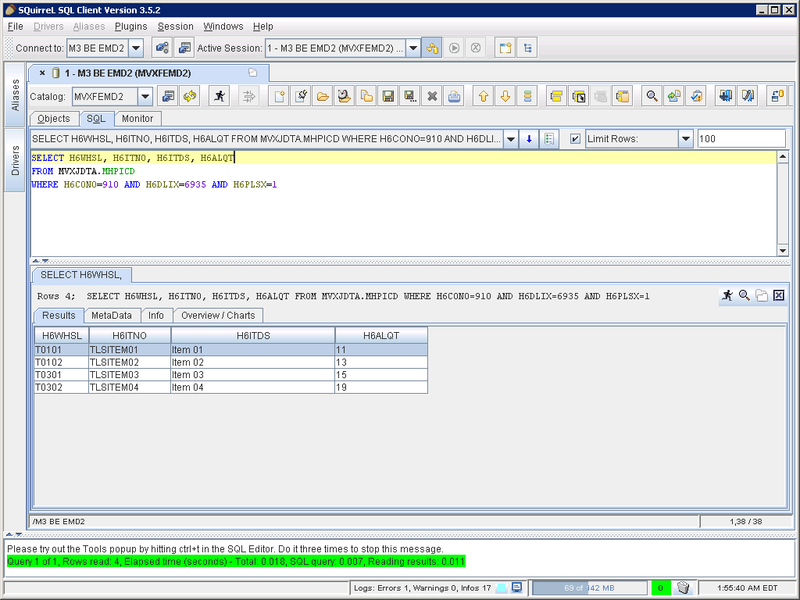 SQL_returnMessage = SQL query SQL: Execution complete. 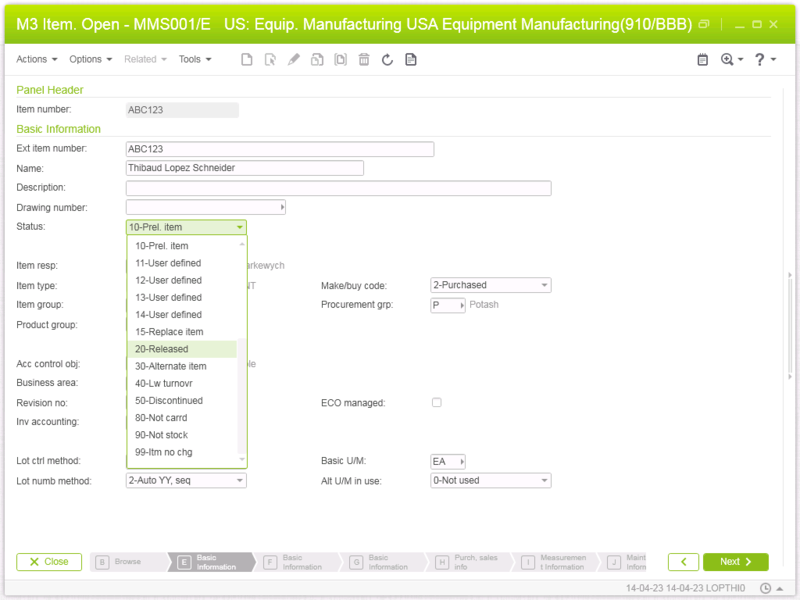 In this post I showed you how to get an M3 picking list and process it using Event Hub, Event Analytics, and Process Automation, to get the picking list details with item number, item description, quantities, and stock location. I also showed you my thought process to identify the table MHPICD for the picking list lines, and the subscription M3:MHPICL:U to get a unique event for the picking list at the right time. In a future work, I will send the picking list to my Glass using the Mirror API, I will get the item image from Infor’s Document Archive, and I will show walking directions on a warehouse plan. That’s it! If you liked this post please subscribe to this blog with the Follow button below, leave your comments in the section below, like, share with your colleagues, and enjoy. 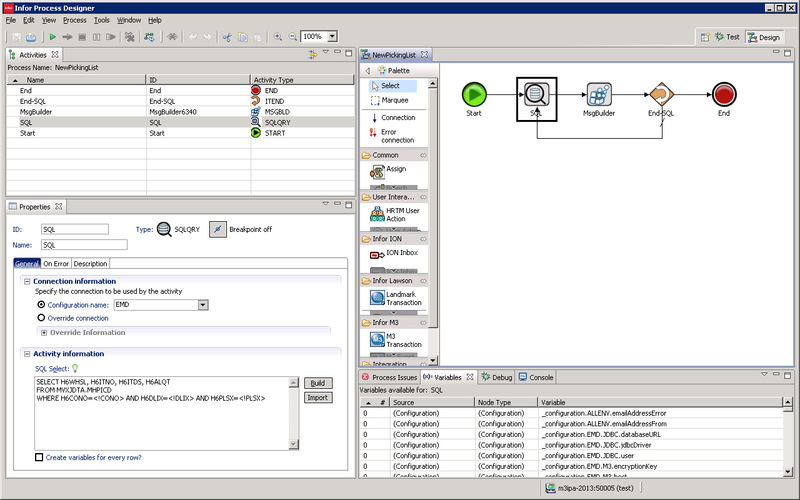 Today I will illustrate how to setup Event Analytics for Infor Process Automation (IPA). 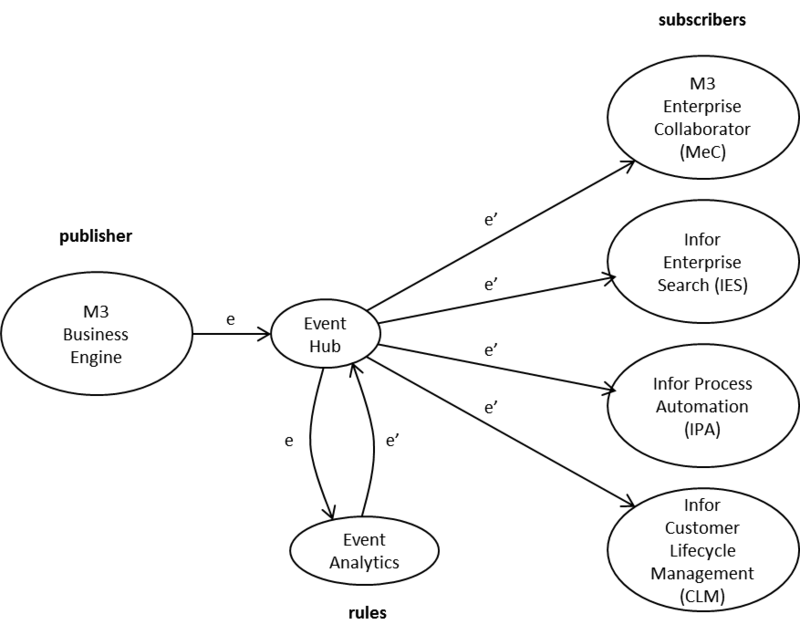 Event Analytics is an application that subscribes to Event Hub, that filters events based on conditions, and that takes actions. My goal is to single out specific Infor M3 events to trigger IPA flows with accuracy, for example to trigger a HelloWrrrld flow only when an M3 Item number ABC123 has changed from Status 10 to 20, specifically. This post is intended for readers already familiar with IPA and Event Hub, yet not too familiar with Event Analytics. For an introduction on Event Hub for IPA, I invite you to read my previous article. 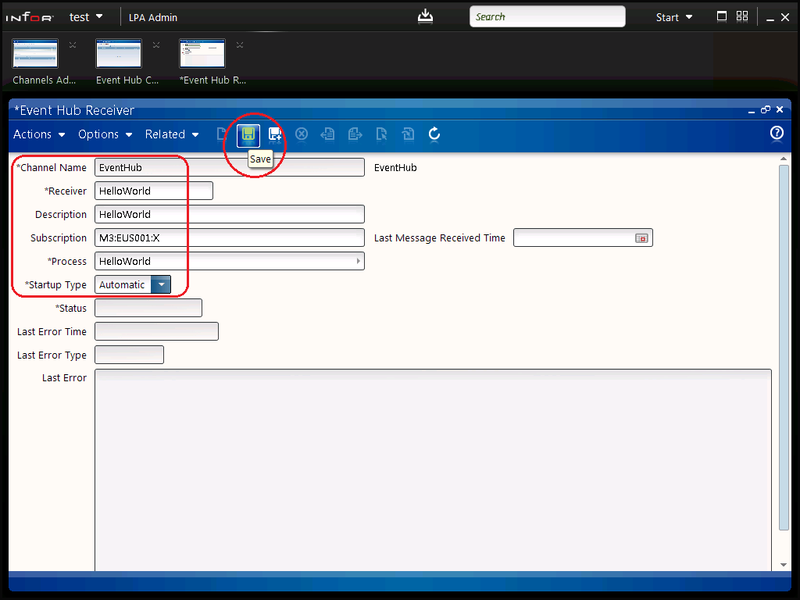 Event Analytics is an application for the Infor Grid that subscribes to Event Hub. It uses a rules engine with business rules to single out specific events out of the million of events produced by M3, i.e. it will find the needle in the haystack, and it will carry out actions. It’ s fast and scalable and doesn’t affect M3 performance. It’s used for example to pass Business Object Documents (BODs) to Infor ION. 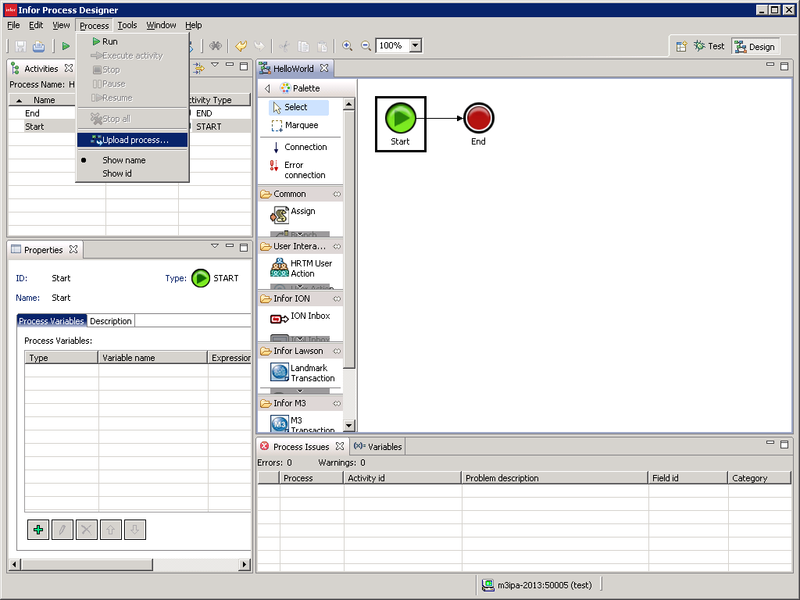 It uses the Production Rule System JBoss Drools, a “Business Logic integration Platform which provides a unified and integrated platform for Rules, Workflow and Event Processing”, and it uses the Drools Rule language, a declarative domain-specific language that looks like when <condition> then <action> . Drools Rule files have the .drl extension. The Smart Rules Editor is an optional plugin for Eclipse based on Drools Expert to help produce Drools Rules for Event Analytics. For further reading on JBoss Drools and Drools Rules, I recommend the Rules Programming tutorial by Srinath Perera. Event Analytics or Event Hub? Why should we use Event Analytics to trigger IPA flows when we can use Event Hub alone? Well, if we used Event Hub alone to directly trigger IPA flows we could potentially get too many false positives. For instance, in my example above I want to trigger a flow only when the Item number ABC123 has changed from Status 10 to 20; I don’t want events for other Item numbers nor Statuses. Unwanted events would create too many unnecessary WorkUnits in IPA, and that would clog the server with noise in the database even if we used an if-then-else Branch activity node at the start of the flow to eventually cancel the execution downstream. The solution is to filter events upstream with Event Analytics. Once a condition is met in a Drools Rule, a typical action for Event Analytics is to post a new event to Event Hub. 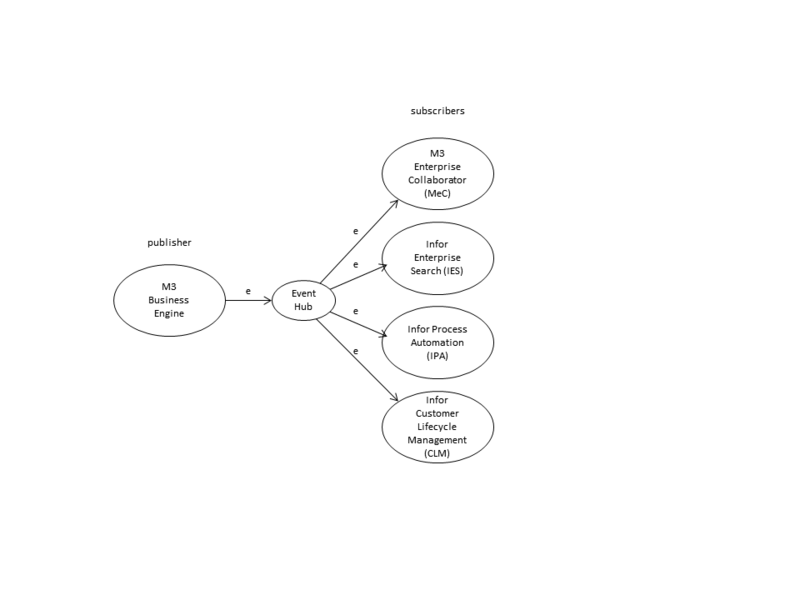 Then, subscribers like IPA can subscribe to those events with Publisher:EventAnalytics instead of the traditional Publisher:M3. Thus, Event Analytics is dual subscriber and publisher. It took me a while to figure out the gymnastics in my head, eventually it became clear. First, I will create a Drools Rule that will subscribe to events where Publisher:M3, Document:MITMAS, and Operation:U, and with the conditions ITNO=ABC123, old STAT=10, and new STAT=20. If that condition is met, the Rule will carry out the action to post a new event MITMAS_ABC123_20. 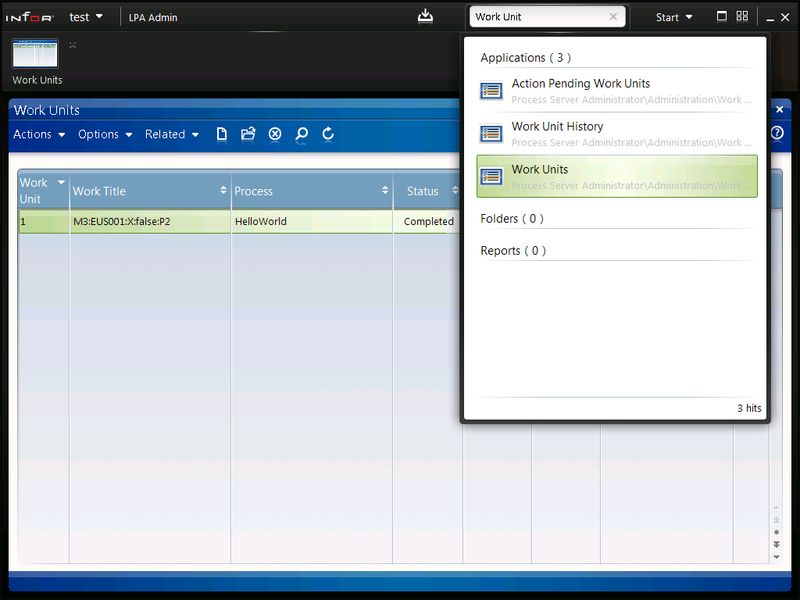 Then, with Infor Process Designer (IPD), I will create and deploy a simple HelloWrrrld flow. The flow will receive as input variables all the data from the event. So I will add a simple activity node that will show the M3 fields <!CONO>, <!ITNO>, <!ITDS>, and <!STAT>. Then, in IPA Rich Client Admin, I will create a new Event Hub Receiver with a subscription to EventAnalytics:MITMAS_ABC123_20 that will trigger the HelloWrrrld flow. Then, I will do a test. I will go to MMS001 in Smart Office, I will prepare an Item ABC123 with Status 10, I will save it, and then I will change it to Status 20. I will also update other Items to produce additional events (noise). M3 will send all those events to Event Hub. Event Hub will pass those events to Event Analytics. Event Analytics will single out the event that matches the condition ITNO=ABC123, old STAT=10, new STAT=20, and it will post a new Event MITMAS_ABC123_20. 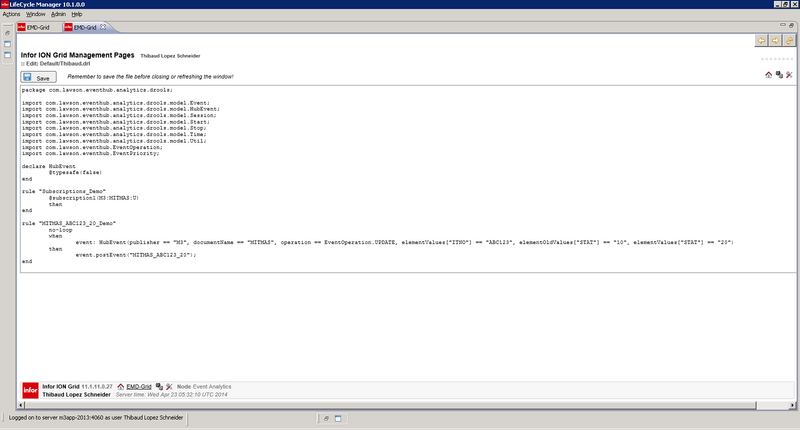 Then, the Event Hub Receiver will receive that event and will trigger my HelloWrrrld flow with the data. Finally, the resulting WorkUnit will contain all the variables of the event, the M3 fields, the old values, and the new values. 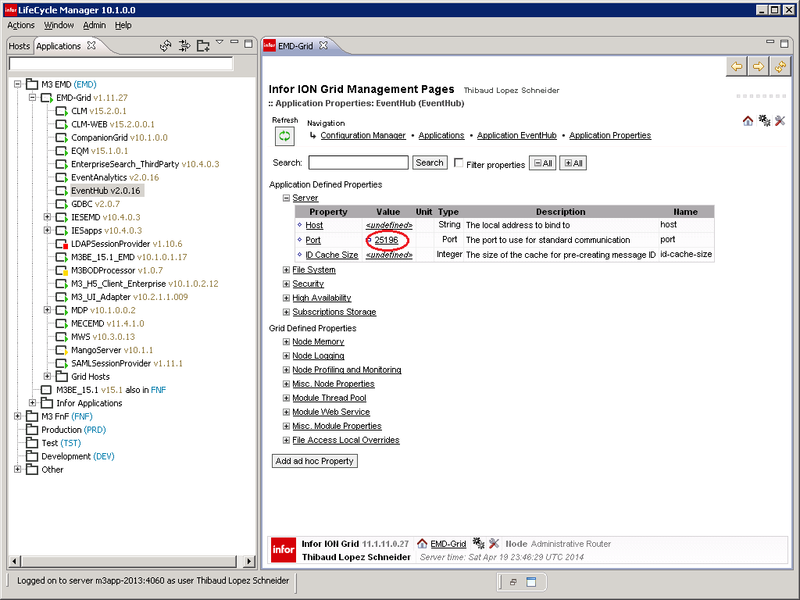 Go to Infor LifeCycle Manager (LCM). Find EventAnalytics in your Grid (expand the tree or use the filter). There will be one or more Sessions. We’ll use Session Default for now. Click Rules. There will be zero or more Drools Rule Language Files, active or not. Click Create. Enter a Resource Name, for example MITMAS_ABC123_20_Rule. The editor will generate a sample Drools Rule with subscription M3:MITMAS:U, and condition elementValues[“STAT”]=”20″. Good. We’ll keep that. Rename the rule MITMAS_20_Demo to MITMAS_ABC123_20_Demo. 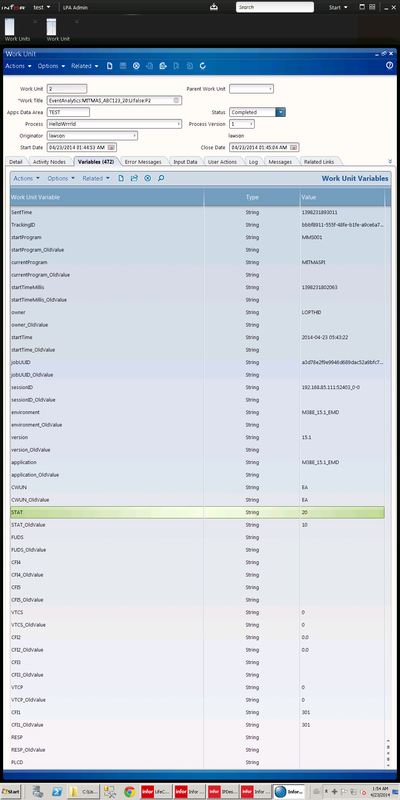 Add the condition elementValues[“ITNO”]=”ABC123″ . Add the condition elementOldValues[“STAT”]=”10″ . In the actions, rename the postEvent to MITMAS_ABC123_20. Delete the rules Start_Demo, Time_Demo, and Stop_Demo. Back in the list of Drools Rule Language File, select the checkbox next to your Rule to activate it. Click Reload to load your Rule. Verify in the list of Rules that your Rule is now there. Then, with Infor Process Designer (IPD), let’s create and deploy the simple HelloWrrrld flow that will show the M3 fields <!CONO>, <!ITNO>, <!ITDS>, and <!STAT>. Go to IPA Rich Client Admin. Create a new Event Hub Receiver. Set the Subscription to EventAnalytics:MITMAS_ABC123_20. The status bar will show “Activate Completed”. Then, let’s do a test in Smart Office. Go to MMS001 in Smart Office. Create an Item ABC123 with Status 10, and save it. Optionally, update other Items to produce additional events (noise). If you liked this post, please subscribe to this blog by clicking the Follow button below. And leave your comments in the section below. That will support and grow the community. Also, spread the word to your colleagues, customers, and partners. And if you have something to share, let me know and I will send you an author invite. And even better, create your own blog to grow the community even more. 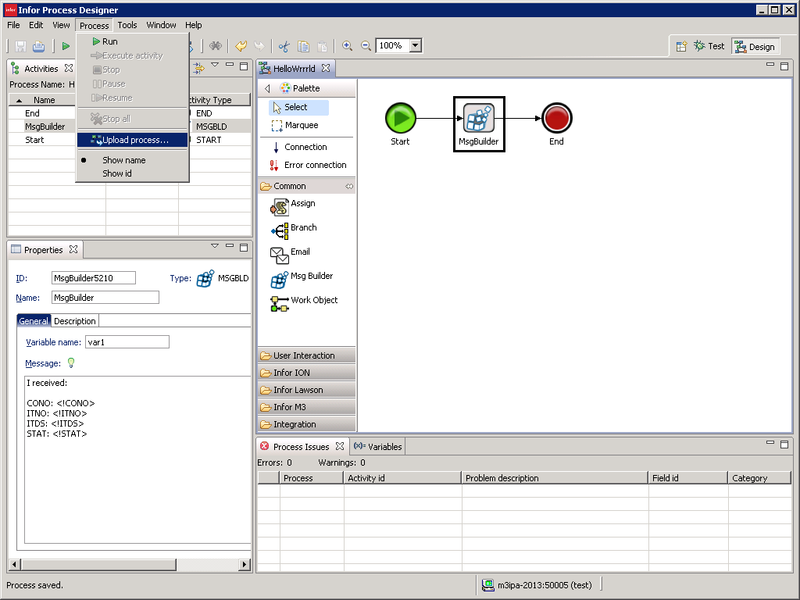 Today I will illustrate how to setup Event Hub for Infor Process Automation (IPA). 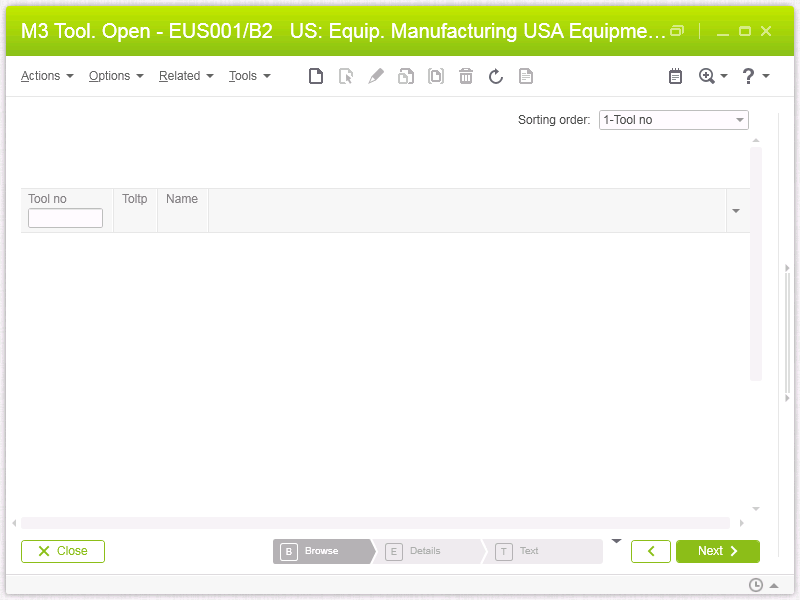 The goal is to receive M3 events in IPA in order to trigger approval flows, for example to trigger a User approval flow when a new User is created in M3, or to trigger a Purchase Order flow when a new Purchase Order is created in M3. This technique has been around for several years and replaces pretty much all the previous techniques to trigger flows. This post is intended for readers already familiar with IPA, yet not too familiar with Event Hub. Event Hub is a publish-subscribe distributed messaging system for M3. It seems to use JBoss HornetQ, the “open source project to build a multi-protocol, embeddable, very high performance, clustered, asynchronous messaging system”, it seems to use JGroups, “a toolkit for reliable messaging [that] can be used to create clusters whose nodes can send messages to each other”, it seems to use Netty, “an asynchronous event-driven network application framework for rapid development of maintainable high performance protocol servers & clients”, and it seems to use Disruptor, a “High Performance Inter-Thread Messaging Library”, based on unzipping the Grid Archive file Infor\LifeCycle Manager\LCM-Server\products\eventhub-installer\components\eventhub-gar-2.0.16.gar. M3 produces millions of events as part of its daily operation. 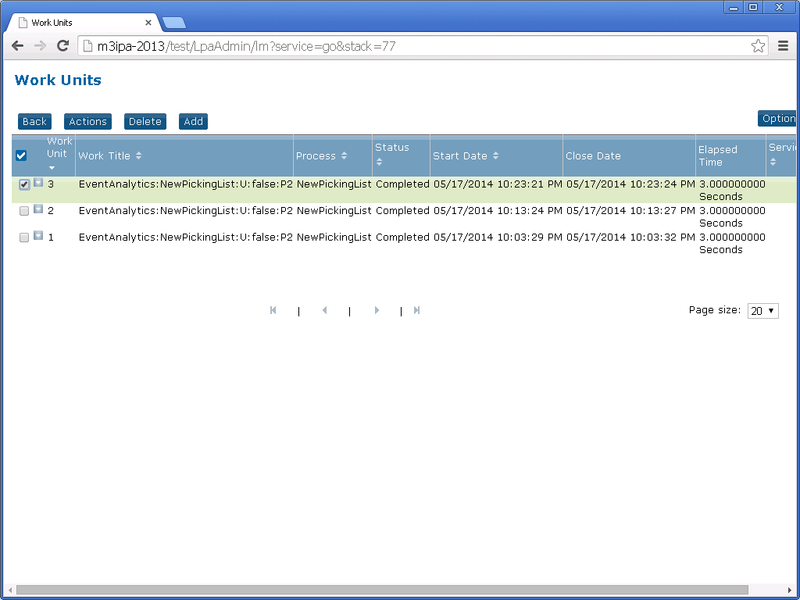 For example: users open programs, they create new records and update existing ones, the database gets updated, etc. M3 is the Producer of events. 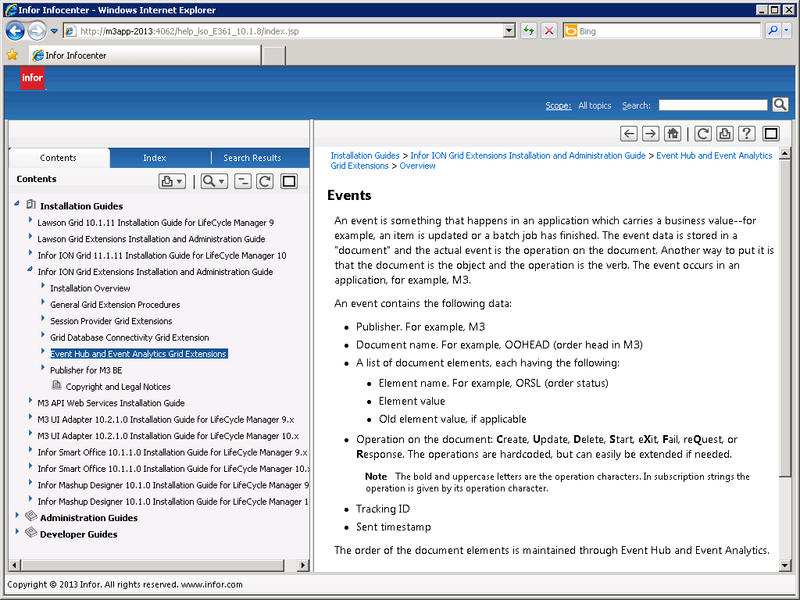 The Documents can be M3 Programs (such as M3 Customer – CRS610) and M3 Tables (such as OCUSMA). The Operations on M3 Programs can be: Start, eXit, Fail, reQuest, and Response. The Operations on M3 Tables can be Create, Update, and Delete. When an event happens in M3, M3 sends that event to Event Hub. 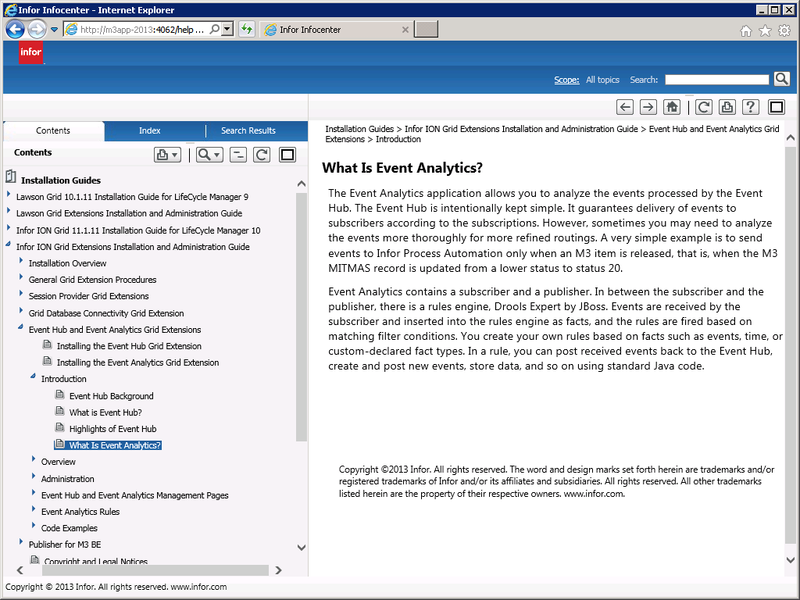 Then Event Hub distributes that event to any subscriber that is interested in that event, for example to M3 Enterprise-Collaborator (MeC) whom will exchange BODs and initiate EDI transactions, to Infor Enterprise Search (IES) whom will update the search engine’s indexes, to Infor Process Automation (IPA) whom will trigger flows, to Infor Customer Lifecycle Management (CLM) whom will synchronize M3 and CLM customer records, etc. I like Event Hub because it’s a beautiful piece of engineering, and it’s based on modern, well documented, open source software. First, I will go to the Event Hub Configuration in my Grid and determine what the host and port number are to subscribe to Event Hub. Then, I will create a HelloWorld flow, and I will setup a subscription M3:EUS001:X that will trigger the flow. The flow will be a simple Start -> End flow with no intermediate activity nodes. No need for fluff. Finally, I will do a complete test, I will: start Infor Smart Office, open and close EUS001, and analyze the resulting WorkUnit in IPA. 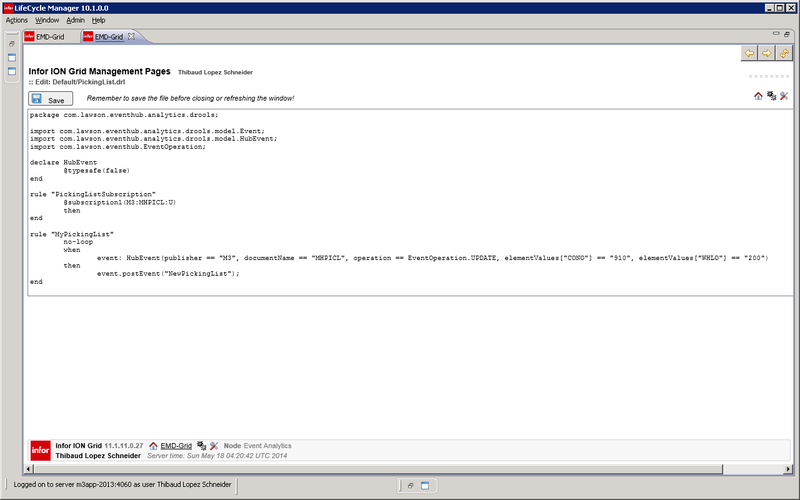 Then, let’s create a HelloWorld flow and setup a subscription M3:EUS001:X that will trigger the flow. Enter a Receiver and Description, for example HelloWorld. Select Process HelloWorld (the flow). Select Actions > Activate, the status bar will “Activate Completed”. Close the Event Hub Receiver window. Close the Event Hub Channel Receivers window. You will be back in the Channels Administrator window. 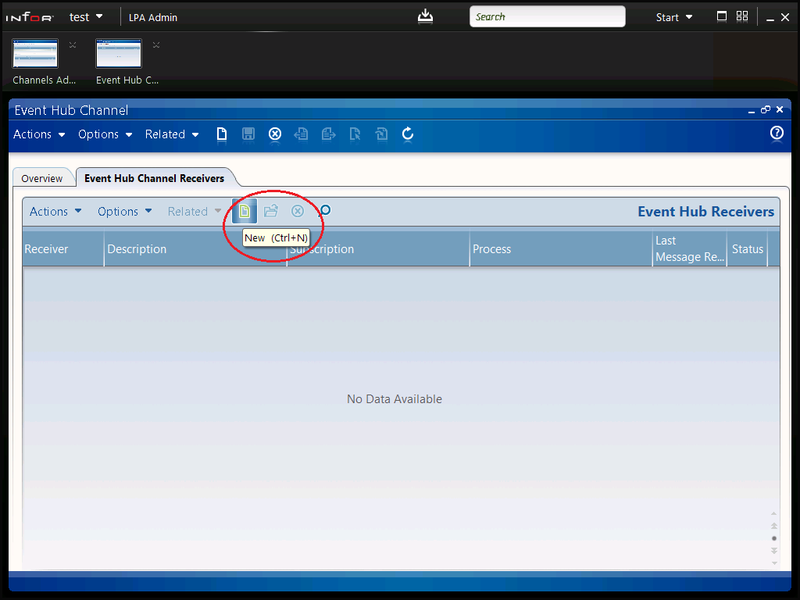 Make sure the Event Hub Channel EventHub is Active and the Event Hub Receiver HelloWorld is Active. You can close the Channels Administrator window. 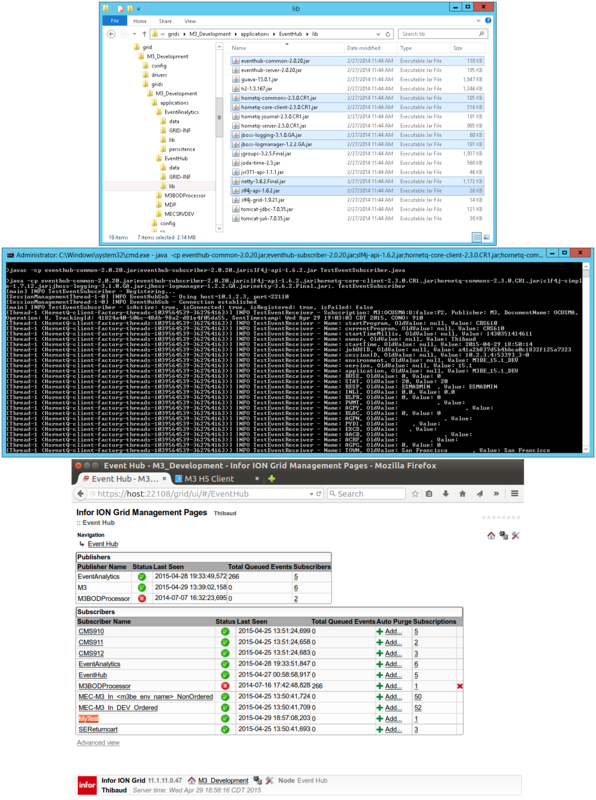 Finally, let’s do a complete test: start Infor Smart Office, open and close EUS001, and analyze the resulting WorkUnit in IPA. Go to Infor Smart Office. That will cause the event M3:EUS001:X to happen in M3, Event Hub will forward the event to IPA, and IPA will trigger the HelloWorld flow. That’s it! We setup IPA as a subscriber of Event Hub, we created a receiver to subscribe to a specific event and trigger our flow, we did a test and caused the event to happen, and we analyzed the resulting WorkUnit. 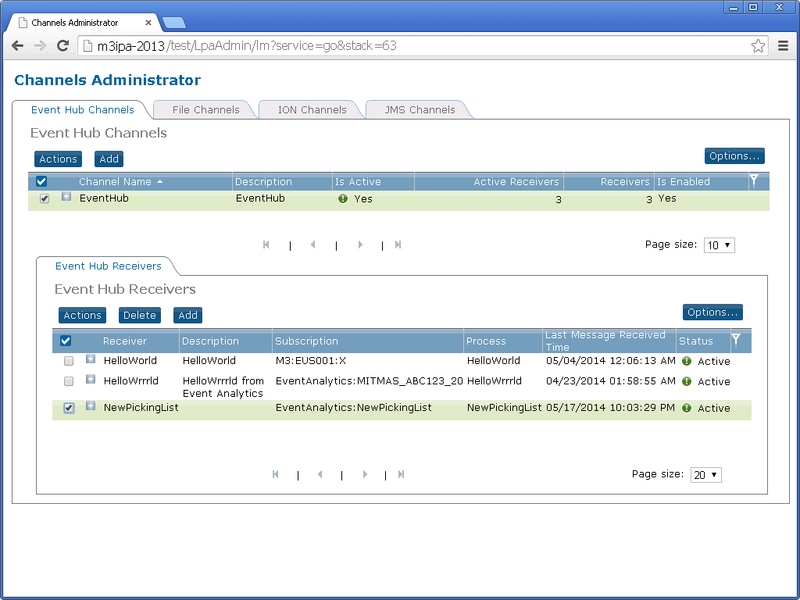 That illustrates how to setup Event Hub for IPA to receive M3 events in order to trigger a flow. Next time I will show you how to setup Event Analytics for IPA and how to setup Drools Rules to filter events with conditions. If you liked this, please subscribe to this blog by clicking the Follow button, and let us know your comments in the section below. You can also become an author and share your ideas (let me know and I’ll send you an author invite).